The development plan for the project received key approvals from the Pleasant Prairie Plan Commission and Village Board in April and May, respectively. These approvals will enable the project to move forward by amending the zoning map from business center to industrial manufacturing use and updating the zoning map to reflect the proposed new use for the property. The $242 million facility will be the first North American manufacturing facility for HARIBO, which is based in Bonn, Germany, and operates 16 facilities in 10 countries. Founded in 1920, the company now sells its candies to more than 100 countries. 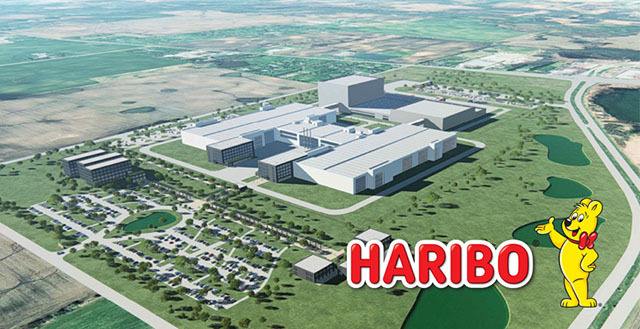 According to the development plan, HARIBO will begin the first phase of construction later this year, including gatehouses for entry to the site, warehouse and high-bay structures, utilities, production, a multilevel parking structure and a helicopter pad. When finished, the development will also include a fitness center, a daycare facility, a museum and a retail store that’s open to the public. The 500,000-square-foot facility is expected to begin operation in 2021, with production operating around the clock. In an incentive deal signed last August, the State of Wisconsin agreed to provide up to $21 million in performance-based tax credits to HARIBO in return for creating at least 385 jobs in the initial phase of the project. The tax credits are also contingent on HARIBO meeting contractual requirements for capital investment, employee training, and goods and services purchased specifically from Wisconsin companies. The company purchased the 137-acre site in December. For information about opportunities in advanced manufacturing; energy, power and control; aerospace; or food and beverage production, contact Mark Rhoda-Reis. For more information about opportunities in other industries, contact Tricia Braun.